Every two minutes, a woman somewhere in the world dies from complications during pregnancy and childbirth. In Europe, a woman’s lifetime risk of death due to childbirth is one in 2,400; in sub-Saharan Africa it is one in 16. We should be outraged. And we should be doing something about it. The majority of these deaths can be prevented if women have access to antenatal advice and support, trained midwives and birth attendants, life-saving treatments, and well-equipped health clinics and hospitals. 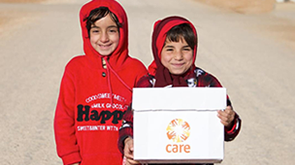 CARE works to ensure women affected by conflict or disasters have access to the health care they need. And we work to ensure women in poor communities have access to high-quality maternal health services – such as through our health partnership with GSK, which has trained almost 27,000 community health workers to provide health services to women in rural communities in nine countries: Afghanistan, Bangladesh, Cambodia, Cameroon, Chad, Laos, Myanmar, Nepal and Togo. But receiving better health care and health knowledge is only one side of the coin. Women must also be able to exercise control over their bodies and live within families that support their rights to a healthy life free from violence. So we also work with community leaders, women and health workers to understand and address the reasons for the high maternal death rate. We challenge social and gender norms so women can make decisions for their own health and well-being.